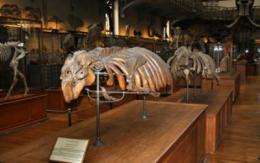 (PhysOrg.com) -- What tales they tell of their former lives, these old bones of sirenians, relatives of today's dugongs and manatees. And now, geologists have found, they tell of the waters in which they swam. 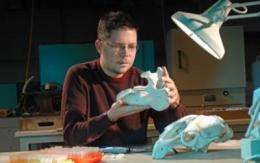 While researching the evolutionary ecology of ancient sirenians--commonly known as sea cows--scientist Mark Clementz and colleagues unexpectedly stumbled across data that could change the view of climate during the Eocene Epoch, some 50 million years ago. Clementz, from the University of Wyoming, published the results in a paper in this week's issue of the journal Science. He and co-author Jacob Sewall of Kutztown University in Pennsylvania used their findings to dispute a popular scientific assumption about the temperature and composition of seawater during the time marked by the emergence of the first modern mammals. The Sirenia, named for the sirens or mermaids of Greek myth, is an order of aquatic, plant-eating mammals that live in swamps, rivers, estuaries, marine wetlands and coastal waters. Four species of "sea cows" are alive today, in two families and genera: the dugong, with one species, and manatees with three species. 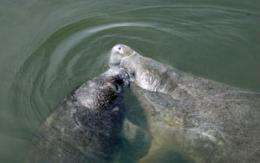 Sirenia also includes the Steller's sea cow, extinct since the 18th century, and others known only from fossil remains. The order evolved during the Eocene more than 50 million years ago. In their paper--"Latitudinal Gradients in Greenhouse Seawater δ18O: Evidence from Eocene Sirenian Tooth Enamel"--the scientists used the isotopic composition of sirenian fossils from a broad time period and geographic area, along with climate simulation data, to add to the long-running debate over Eocene climate. "This study demonstrates the value of the fossil record, and of examining the deep time record of paleoclimatological events, so we can better understand climate change today," says Lisa Boush, program director in the National Science Foundation (NSF)'s Division of Earth Sciences, which funded the research. "This novel approach will potentially transform our way of thinking about the hydrologic response to global climate change." "I wasn't looking at it from this direction when we started the project," says Clementz, whose research is part of an NSF CAREER award. "But once we started accumulating enough samples, we could step back and get a better understanding of the habitat and dietary preferences of these fossil species, and also of the big picture. We saw that it could be reflecting climate and environmental change." A new look at climate during the Eocene, when Earth underwent a dramatic change, could help scientists better understand global climate change today. Most scientists assumed that the oxygen isotopic composition of seawater in the past was very similar to that of today, with high values at low latitudes and low values at high latitudes. Isotopes are variants of atoms of a particular chemical element, in this case oxygen, with differing numbers of neutrons. "But when we looked at the oxygen isotopic values of the fossils from low-latitude sites for the Eocene, they were much lower than we would predict," says Clementz. The finding suggests that low-latitude sites during the Eocene were much wetter than today. "This created a very different distribution in the oxygen isotopic composition of seawater for this time interval, which would, in turn, significantly impact estimates of paleoclimate and paleotemperature in the distant past," says Clementz. "Scientists have used this assumption of the oxygen isotopic values of seawater to constrain temperature estimates for the past." In their paper, Clementz and Sewall show that the assumption may be flawed, which could mean that previous estimates of water temperature are incorrect. 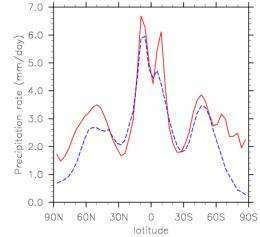 The Eocene greenhouse climate state has been linked to a more vigorous hydrologic cycle at mid- and high latitudes; similar information on precipitation levels at low latitudes is, however, limited. Oxygen isotopic fluxes track moisture fluxes and, thus, the δ18O values of ocean surface waters can provide insight into hydrologic cycle changes. The offset between tropical δ18O values from sampled Eocene sirenian tooth enamel and modern surface waters is greater than the expected 1.0 per mil increase due to increased continental ice volume. This increased offset could result from suppression of surface-water δ18O values by a tropical, annual moisture balance substantially wetter than that of today. Results from an atmospheric general circulation model support this interpretation and suggest that Eocene low latitudes were extremely wet. Wish the article would tell us if the estimates are too high or too low. I cannot tell from reading this article and so would have to run off to do more research. Would like it the writer would think of the reader who is NOT an expert in the Eocene and just add a couple of sentences or references to help us. Thanks! It sounds like the wrong assumption is; they've previously thought the climate was drier back then than this sirenian evidence indicates. Yes some error bars would be nice. They seem to indicate a finding of a warmer as well as wetter climate than expected.